Michelle Obama made it a fashion tradition Monday night, wearing a custom-made Jason Wu gown to the inauguration balls. The ruby-colored dress was a follow-up to the white gown Wu made for her four years ago when she was new to Washington, the pomp and circumstance, and the fashion press. She now emerged in velvet and chiffon as a bona fide trendsetter. "I can't believe it. It's crazy," said Wu, reached at his Manhattan studio. "To have done it once was already the experience of my life. To have a second time is tremendous." President Barack Obama also struck a similar style chord to his first-term inaugural balls: He wore a white tie with his tuxedo. 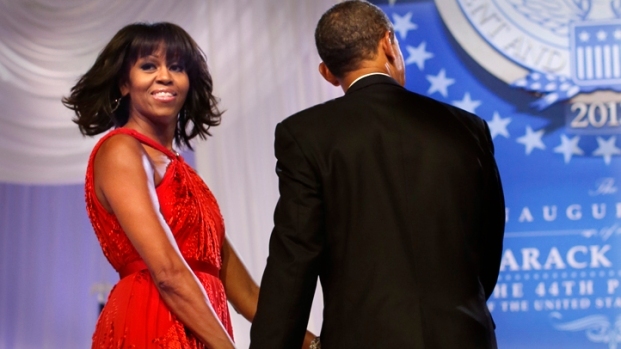 The red halter dress was the only one Wu, who went from fashion insider to household name on this night in 2009, submitted for Mrs. Obama's consideration. He collaborated with jeweler Kimberly McDonald on the jeweled neckline. "For this occasion, it had to be real diamonds," Wu said. He said he felt the dress showed how he has grown up as a designer — and how Mrs. Obama's style has evolved to be even more confident. The first family headed out to inaugural festivities earlier on Monday with Mrs. Obama leading a very coordinated fashion parade in a navy-silk, checkered-patterned coat and dress by Thom Browne that were inspired by a menswear necktie. The outfit was specifically designed for Mrs. Obama, but Browne said he wasn't 100 percent sure she was going to wear it until she came out with it on at Inauguration. "I am proud and humbled," he said. 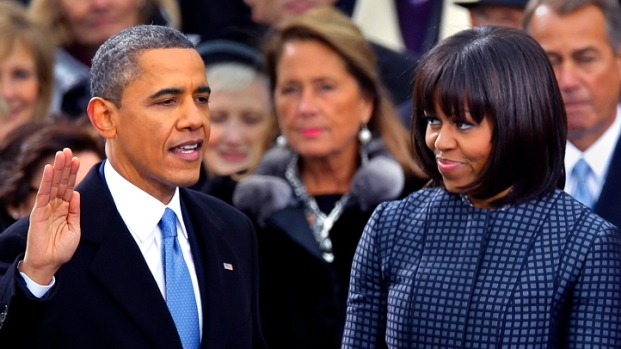 The rest of Mrs. Obama's Inauguration Day outfit included a belt from J. Crew, necklace by Cathy Waterman and a cardigan by Reed Krakoff, whose ensemble she also wore to yesterday's intimate, indoor swearing-in ceremony. Obama wore a blue tie with his white shirt, dark suit and overcoat. 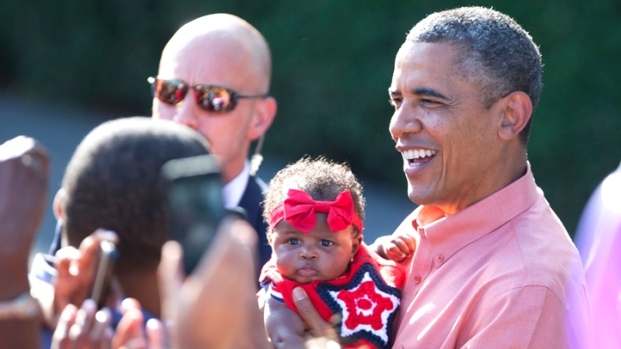 Malia Obama had on a plum-colored J. Crew coat with the hemline of an electric-blue dress peeking out and a burgundy-colored scarf, and her younger sister Sasha had on a Kate Spade coat and dress in a similar purple shade. "It is an honor that Sasha Obama chose to wear Kate Spade New York," said the company's creative director, Deborah Lloyd, in an email to the Associated Press. "She epitomizes the youthful optimism and colorful spirit of the brand. We are so proud to have been a part of this historic moment." Jenna Lyons, creative director of J. Crew, said it was "a huge point of pride for all of us" to be a part of the day — as the brand was back in 2009 when the girls wore outfits by CrewCuts, its children's label. "It's amazing to see the evolution of the family. I love the way Michelle looks. She looks beautiful in something so clean and tailored. It's such an elegant choice," Lyons said, "and they all look so sophisticated! You can see how the girls have grown up in the four years, and they're still so alive and vibrant, but more sophisticated." The vice president's wife, Jill Biden, wore a gray coat and dress by American designer Lela Rose. Mrs. Obama has worn Browne's designs for other occasions, including a gray dress with black lace overlay to one of the presidential debates last fall, and she honored him last summer at the Smithsonian's Cooper-Hewitt National Design Awards for his contribution to fashion. Browne made his name in modern — very modern — menswear, but he launched womenswear in 2011. He was in Paris on Monday, just finishing previews for his next menswear collection. The idea to use the tie fabric came to him because he was indeed designing these men's clothes at the same time, he explained. "I wanted 'tailored' for her. For me, she stands for strength and confidence, and that's what I wanted to design for her," he said. 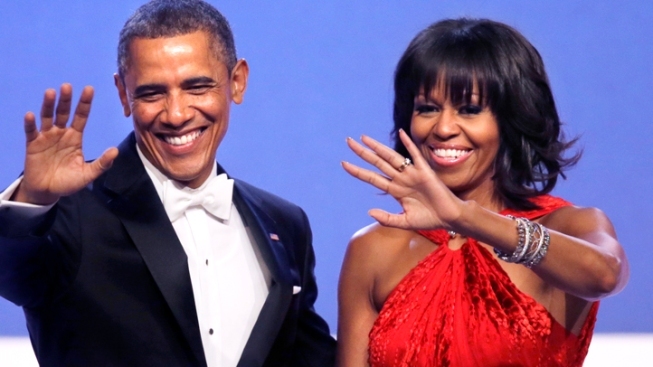 Simon Collins, dean of the school of fashion at Parsons The New School for Design in New York, said the Obamas dressed in their typical fashion: one that shows pride in their appearance. "They are a stylish couple and their children look fabulous. Too many people get dressed in the dark," he said. "They show it's good to dress up, take pride in how you look. ... It's a wonderful example for America and the rest of the world." He also noted that the Obamas seem to understand that the fashion industry is a driving force in the U.S. economy and that its lobby is a powerful one. They don't treat fashion frivolously, he observed. The first lady "is so supportive of so many American designers," Browne noted. But Collins said he was a bit surprised the public doesn't pay much attention to the president's wardrobe. He joked that Obama should perhaps try one of Browne's signature shrunken suits — the ones that show a man's ankles. At the end of the Inaugural festivities, Mrs. Obama's outfit and accompanying accessories will go to the National Archives.